On Friday morning, at a press conference held in Texas, Chris Christie officially endorsed Donald Trump. This endorsement came as a surprise to, well, everybody, considering that Christie dropped out less than three weeks ago, and has generally positioned himself as a more moderate and sensible Republican than Trump — the former spoof candidate-turned-frontrunner. "He is going to lead the Republican Party to victory in November over Hillary Clinton," Christie insisted. This statement — that Trump was the only Republican who could beat Clinton in the November general election — was one Christie repeated several times throughout the press conference. "I am proud to be here to endorse Donald Trump for president of the United States," is how Christie opened the surprising event. Onlookers were initially stunned to even see the two on stage together, considering that the pair had been not only rivals, but also on opposite ideological sides of the Republican spectrum. "This was an endorsement that really meant a lot," Trump said in response. "It's from an outstanding man, with an outstanding family, and he's done an outstanding job." Trump and Christie were not always on the same side, of course. That said? "We have been good friends with Donald and his family for years," Christie insisted. "When did I make my final decision? Yesterday morning," he went on to say, describing a scene in which he visited Trump on Thursday and the two agreed to publicly declare Christie's endorsement in Texas Friday. "[Trump] is strong enough to take on the D.C. establishment, which is represented by Marco Rubio," he continued. Trump himself butted in to take a jab at Rubio's make-up prior to the debate, which he claimed was overdone. Both Trump and Christie took the opportunity to really lay into Rubio, suggesting they see him as a greater threat than Cruz. 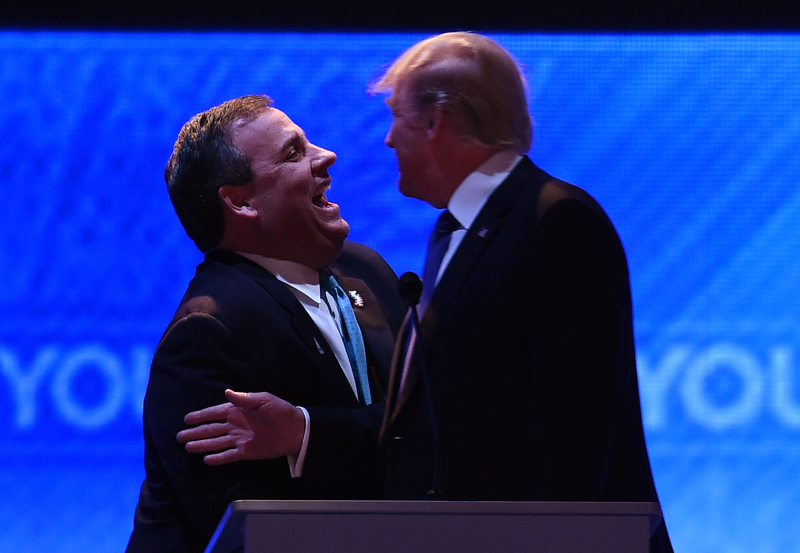 "The one person that Hillary and Bill Clinton do not want to see on that stage is Donald," Christie claimed. Part of Christie's initial platform as candidate had been to attack the "establishment," which he claimed was best represented by Clinton — whom, he had argued, would definitively be the Democratic nominee. Now, Christie is taking that logic farther, by arguing that the only viable contender to beat the "establishment" candidate is the opposite of an establishment candidate: Donald J. Trump.